I may have blogged about a strikingly similar Essie colour a few weeks ago, but I bought Essie 'Muchi Muchi' when I thought I'd lost 'Fiji'. I've had a couple of comments saying they can't find 'Fiji' so this is a pretty good dupe if you're looking for one! Muchi Muchi is a more baby pink as opposed to the whiter shade of 'Fiji' but as you can see in the pictures above, it's not drastically different. Again, the formula is like most Essie polishes, 3/4 coats to get it opaque which can be extremely time consuming as it does tend to smudge if it's not totally dry. However, once it's dry it does not budge. I've found Essie to be one of the longest lasting polishes I've tried so I can forgive the time consuming painting session! I hope this has helped anyone who can't find 'Fiji'. 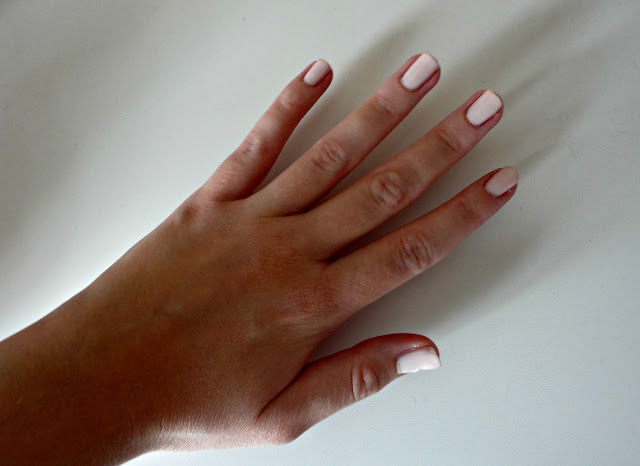 It does seem to be a difficult shade to find so this might be a good option if you want to try the white-pinks Essie does so well! Lovely blog, I'm a new follower. This is such a lovely shade, it looks so good with your skin tone.